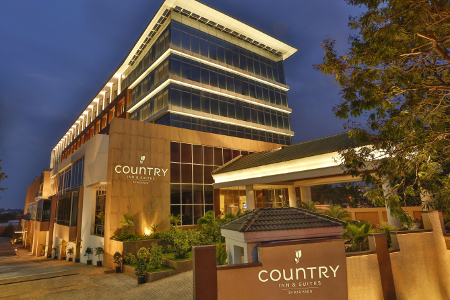 The Country Inn & Suites® by Radisson, Mysore offers a modern retreat near major attractions like the Brindavan Gardens. Only 15 minutes from Mandakalli Airport (MYQ) and three minutes from National Highway 275, our hotel near Infosys Mysore offers easy access for traveling families. During your stay, be sure to take the kids to see downtown sights like Mysore Palace and Mysuru Zoo. Are you in town for work? Utilise our business centre to plan an outdoor reception for your colleagues. When you aren’t out and about, treat yourself to a delightful day by our outdoor pool. 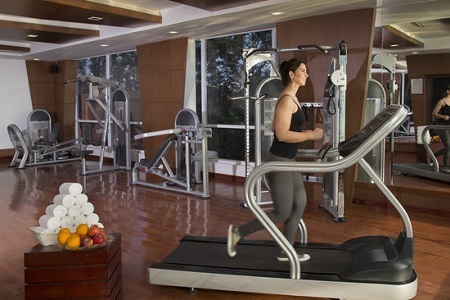 After an invigorating swim, you can exercise in the well-equipped fitness centre to keep up your workout routine. If you’re too tired for a sit-down dinner at one of the on-site restaurants, take advantage of our 24-hour room service, and stop by PB&G for poolside drinks later. To show our commitment to maintaining a family-friendly atmosphere, we also provide a kids’ play area, a children’s pool and an on-call doctor. Before embarking on a sightseeing adventure to local temples, join us each morning for a free, hot breakfast. 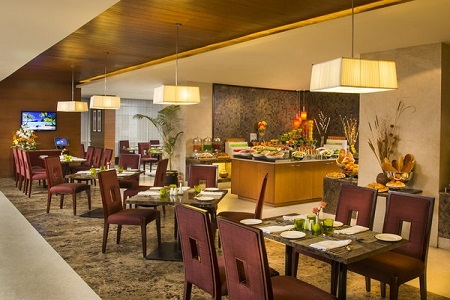 Indulge in an eclectic buffet or pick and choose from a large list of à la carte items at our Mosaic restaurant. The extensive menu features Asian, European and regional cuisine, plus an impressive wine list. Start with a chilled beverage and a hot soup like thakkali rasam and then order one of the South Indian entrees at Spice. You can end your meal with a creative cocktail or a glass of wine. At PB&G, you and your family can enjoy a casual meal while listening to the soothing waters of the infinity pool. This outdoor dining venue offers Asian appetizers, Indian entrees and international cuisine. Mysore Palace – Drive 10 kilometres to the heart of Mysuru to see one of the largest and most visited palaces in the country. A priceless national treasure designed by Henry Irwin, the palace is a three-storey stone structure with marble domes and a 44-metre tower. Mysuru Zoo – Near the palace in the city centre, Mysuru Zoo boasts 250 acres of beautifully manicured vegetation and live animal exhibits. This zoological park, located 12 kilometres away, is perfect for a day trip with the family. Brindavan Gardens – These exquisite gardens are located 11 kilometres north of the hotel along the KRS Dam of the Kaveri River. In addition to viewing flowers and plants, you can take a boat ride beneath the dam and listen to the musical fountains, the gardens’ main attraction. Read more about our Infosys Mysore hotel’s location. For a charming and convenient venue near the MYQ airport, reserve our ballroom for up to 320 guests. We also offer lovely outdoor spaces suitable for parties and receptions. Our professional staff is available to assist with details like customised catering, decorations and audiovisual needs to ensure your event is memorable. Pet policy: We do not allow pets inside. ID policy: All foreign nationals and non-resident Indians are required to present their passport with visa at check-in. All Indian nationals must present a government-issued photo identity card with an address.